GLENDALE, Calif., July 2, 2018 /PRNewswire/ -- Applebee's® Neighborhood Grill + Bar has a new Neighborhood Drink this month that is unlike anything you've seen before. The new $3 Grey Goose Vodka and Ocean Spray® Cranberry Juice Cocktail - also known as 3 DOLLAR Goose and Cranberry – is handmade with Grey Goose Vodka, a top-ranked, ultra-premium vodka, and mixed with Ocean Spray® Cranberry Cocktail. 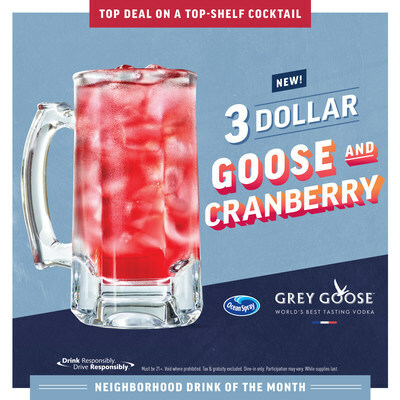 The new 3 DOLLAR Goose and Cranberry is available now at participating restaurants nationwide for the month of July. "In a show of appreciation to our guests, this is the first time we're offering a world leading, ultra-premium spirit at an incredible price," said Patrick Kirk, vice president of beverage innovation at Applebee's. "We're known for making a splash with our Neighborhood Drinks, and the new 3 DOLLAR Goose and Cranberry is an amazingly refreshing premium cocktail that's perfect for a hot summer day and a huge win for our loyal guests at only $3." Applebee's $3 Grey Goose Vodka and Ocean Spray® Cranberry Juice Cocktail is available all day while dining in at participating Applebee's locations. For more information on the 3 DOLLAR Goose and Cranberry and other limited time offers from Applebee's, view the online menu and stop by your neighborhood Applebee's restaurant. Price, participation and hours or availability may vary by location, and guests must be 21-years old or over to enjoy responsibly. Void where prohibited. Applebee's Neighborhood Grill + Bar offers a lively casual dining experience combining simple, craveable American fare, classic drinks and local drafts. All Applebee's restaurants are owned and operated by entrepreneurs dedicated to serving their local communities, and offering quality food and drinks with genuine, neighborly service. Applebee's is one of the world's largest casual dining brands; as of March 31, 2018, there were 1,923 Applebee's franchise restaurants in all 50 states, Puerto Rico, Guam and 13 other countries. Applebee's is franchised by subsidiaries of Dine Brands Global Inc. [NYSE: DIN], which is one of the world's largest full-service restaurant companies.